Replacing the long in tooth ref. 5004, the new platinum cased 5204P is a split seconds chronograph with perpetual calendar, based on Patek Philippe’s in-house CH 29 movement. 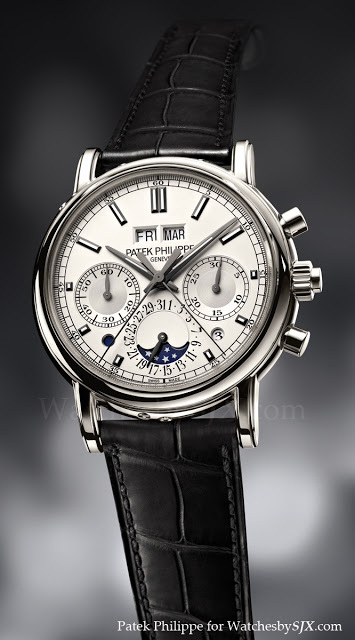 In contrast to the elegant and beautiful 5940J perpetual calendar also launched at Baselworld 2012, the new 5204P rattrapante is a not particularly handsome. The luminous dial and hands are inappropriate for suc a watch in my opinion. They are, unfortunately, ugly. The fact that the dial is solid gold doesn’t help its aesthetics. 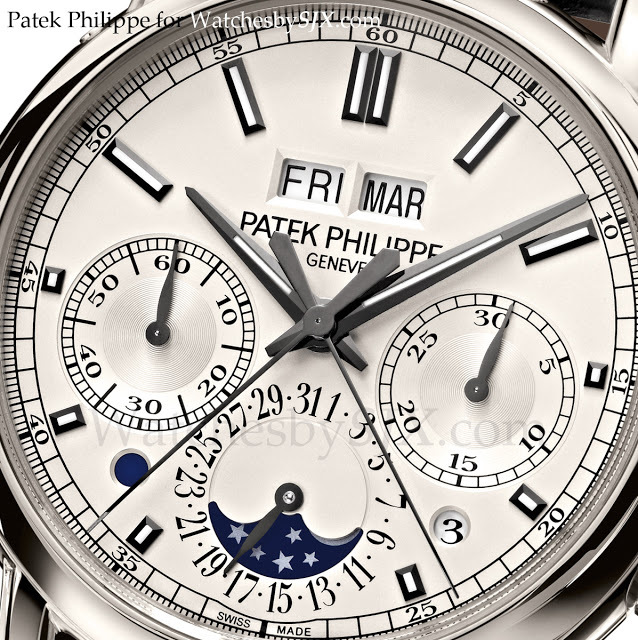 That being said, the movement is impressive, both in terms of construction and finishing, as is expected for Patek. It uses the in-house CHR 29-535 PS Q, building on the CH29 movement used the ref. 5170J and ref. 5270G. This is quite an improvement over the Lemania 2310-based ref. 5004. One reason being that the Lemania 2310 was never designed to have a split seconds module added, so it was delicate and sometimes unreliable. On the other hand the CH 29 is designed to be far, far more robust, according to what Philippe Stern related to me a few years back. In particular, the new design for the split seconds isolator is slimmer and more reliable than the isolator with the octopus wheel in the ref. 5004. 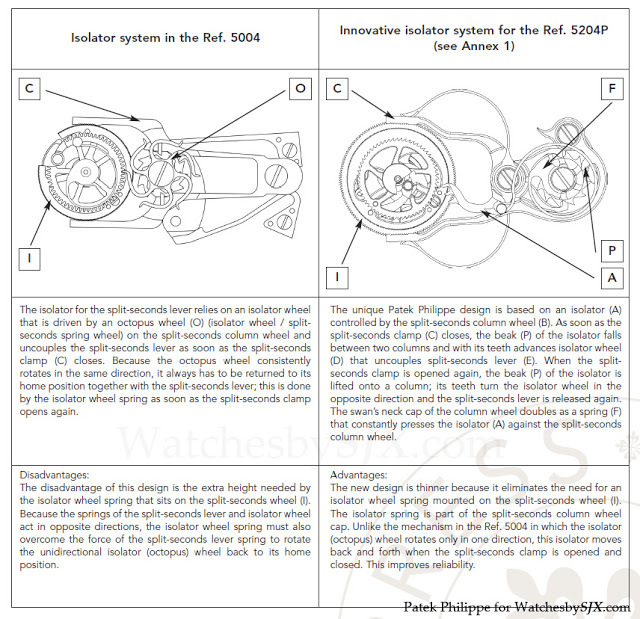 Also, because of a redesign split seconds lever and cam, the position of the two central seconds hands are far more precise in relation to each other when reset to 12 o’clock, a 75% improvement according to Patek. 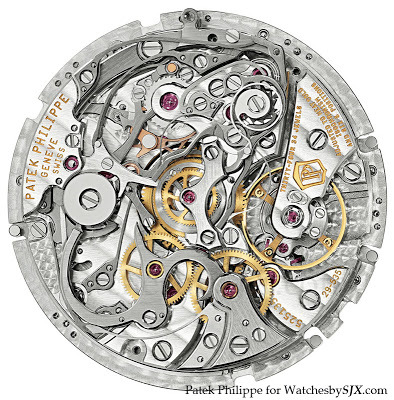 This CHR 29 calibre will undoubtedly be in production for a long, long time, so there’s hope for a redesigned dial. I have the book by Leonardo Arte and it’s a beautifully illustrated publication with lots of large photos of vintage Pateks.